Now that the ink has dried on the measure raising the minimum wage in the city of Los Angeles to $15 by 2020, it’s time for Mayor Eric Garcetti to guarantee equal pay for equal work for Airport Police officers. We are a minority-majority police department. So it’s hard to believe that in a city that champions and, in fact, paves the way for equality for all on all matters, that in 2015, Airport Police officers are still treated like second-class citizens when it comes to pay. This, even though the danger we face and the work we do in keeping Angelenos and the 150,000 passengers who travel through the nation’s second-busiest airport safe is in no way different from our sister agency, the Los Angeles Police Department. It’s been over six years since the men and women responsible for public safety at LAX, L.A./Ontario International and Van Nuys Airports have had a cost-of-living adjustment. When the City was in a budget crisis, we selflessly agreed to a 20% pay cut on our last contract to “share the sacrifice” with LAPD. Well, it’s 2015 and our last contract expired in 2010. Our contract is no cost to Los Angeles taxpayers because the Airport Police are not paid through any city or state tax dollars. We are funded entirely by proprietary airport landing fees and other airport-related revenues. And while LAX has enjoyed increased passenger loads topping more than 10 million in the past five years, and it seems that with every new week there’s some announcement of bigger and better improvements at LAX, little is said about making sure that the men and women who are the first line of defense in any terror-related situation at L.A.’s three airports are fairly compensated. The mayor and Council President Herb Wesson supported making all police hiring standards the same, which included legislation that gave Airport Police officers the same authority as LAPD and L.A. Port Police. However, LAPD officers who are working at LAX have their salary, benefits and retirement paid for by Los Angeles World Airports at a much higher rate than Airport Police. How is that in any way fair? The bottom line is that the City is sending a message that Airport Police, while duly sworn law enforcement officers who do the same work as LAPD officers, are not equal. So while we applaud Mayor Garcetti, Council President Herb Wesson and the entire City Council on passing the $15 minimum wage law, your work is not done. 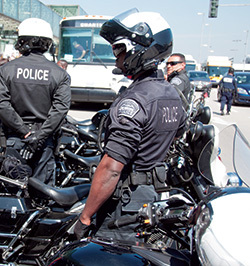 Airport Police officers deserve equal pay for equal work, and that means a compensation and retirement plan on the same level currently enjoyed by our sister agencies, the LAPD and L.A. Port Police. Anything less is sending a message of “separate but equal” to the rank-and-file men and women whose lives are no less valuable than other police officers working in the city of Los Angeles. That’s not a message that works well when trying to recruit the best and brightest applicants. We hope that the same goodwill that spearheaded the City’s minimum wage increase extends to finally achieving parity in compensation and retirement for Airport Police officers with the City’s other police agencies.